While there was a time when improvisation was seen as nonessential to string education, today most teachers agree that they would like to incorporate improvisation into their classrooms. The National Association of Schools of Music requires some improvisation be learned while earning a Bachelors of Music Degree; the American String Teachers Association is incorporating more improvisation through the Eclectic Styles area of their conventions. A significant barrier is that many string teachers were not required to learn a great deal of improvisation during their own education. For them, the idea of trying to teach something so foreign is remarkably daunting. The good news is that all string educators have the knowledge and experience to teach improvisation, whether they realize it or not. Today I’d like to provide an outline for string teachers to learn improvisation and suggest a method to incorporate improvisation into the classroom. As mentioned above, all string teachers have the ability to learn improvisation. Learning to improvise is very similar to learning an etude or concerto, and if practiced can be mastered like anything else. Below are some basic steps to get you started. The first step is to select a simple chord progression, perhaps with just two or three basic chords, and then to focus on the notes in each triad. While many jazz educators put an emphasis on scales, learning just the triads is remarkably effective and is less information to absorb. Again, focus on the triads only. For example, if your chosen progression includes seventh chords, ignore the sevenths. The idea is to not overload your brain on the first day! The basic blues progression is an excellent place to start since it only has three chords. Once the triads of a progression are understood, the next step is to practice different notes in each triad using different rhythmic patterns. This is how I teach beginning improvisation to both string and jazz students, and it has proven to be very efficient over the last seven years. Pick a simple rhythmic pattern that lasts for a few beats in a 4/4 measure. Examples of patterns could be “one two-and” or “one two three-and.” Then, pick one of the notes in the triad of the chords (e.g. the root or the third), and play only that note of the chord using only the chosen rhythm. Begin with only two chords moving back and forth (e.g. C to G), and by playing the root of each chord with the chosen rhythm. As with any practice, starting slower is always better. Eventually, you can choose different notes in the chords (the third and fifth) and add more chords to your chosen progression. After understanding chord structures and rhythmic vocabulary, one can add a great deal of interest using some basic chromaticism. While many theorists may disagree with my terminology, I call this Improvising with Ascending and Descending Chromatic Leading Tones. Don’t let the impressive name frighten you away! Essentially, you can precede any note in the triad of a chord with a note that is one half-step above or below the note you are resolving to in your phrase. While these chromatic notes are not technically in the chord, they will sound great as long as there is a resolution to a note in the triad. I have found this method to be more effective than scales because the student does not have to learn as many notes. It is also advised that you land on notes in the triad on strong beats and use the chromatic leading tones on weak beats. For more information on this general subject, you can peruse my treatise on improvisation here. Once a teacher feels they have a basic understanding of improvisation, they can more confidently introduce the subject into the orchestra rehearsal room. The trick here is to not overwhelm or discourage students. While the use of theory is very effective for individuals, it is often too much information for an entire orchestra class. The following are ways I have taught improvisation in group settings in various string camps and school classrooms. While this is easier said than done, it is important the music fit the needs of the musicians. What I find works best is some type of piece that is mostly written out for the students, but has a specific section where anyone in the ensemble is given a chance to improvise while being accompanied. Also, look for music with an improvisation section containing few chord changes, or (better yet) just one chord. A great example would be something that allows the students just to improvise in a key that they know well, such as D Major. Personally, I have arranged music that fits this purpose, and have used it in string camps with young students as well as the Oklahoma City Cello Project. One arranger who has written a lot of music appropriate for this type of exercise is Bert Ligon, professor of music at the University of South Carolina. And of course, violinist Mark O’Connor has written extensively on this subject with his series of books. The scariest thing about improvising is that students are “soloing.” This is very, very daunting the first time and should not be forced upon anyone. Also, the smaller the ensemble, the better – this usually works best during sectionals or solo & ensemble rehearsals. Find students willing to experiment, and allow them to each take a turn improvising. Once they are finished, provide a great deal of praise for what they played regardless of how it sounded. This will not only give the students who improvised incentive to try again, it will encourage the students that did not improvise to try it out the next time. When an enthusiastic student begins to improvise and has shed fear, he or she usually plays a great number of notes without stopping. This is typical and should not be discouraging to the teacher. The easiest way to correct this is to force limitations on the students. My personal favorite is “play a bar, rest a bar.” When students are forced to rest for an entire measure, instant phrases are created. They may think it sounds empty, but as a long as everyone in the class is doing this then it will not seem out-of-place. It will also force students to take time to think about their ideas rather than just playing notes to fill space, and will allow them time to breathe with their phrases. This exercise can have many variations, e.g. rest a bar and play a bar, play a bar and rest two bars, rest two bars and play two bars, etc. When students have become proficient in the aforementioned exercises, there may come a time that it is appropriate for them to find a private teacher that can help them with improvisation. Applied Improvisation Lessons are common in many jazz curriculums across the country, but not so much in string education. Nevertheless, any instrumentalist that can improvise can teach any other instrumentalist to do the same, as long as the student has basic proficiency on her or his instrument. I have personally taught improvisation to bassists, trombonists, pianists, cellists, guitarists, and violinists, and have had the same amount of success regardless of instrument. I hope this post has encouraged you to explore improvisation with your string students.I am very excited to see what the future holds for improvisation in string education. Feel free to contact me to continue the conversation. 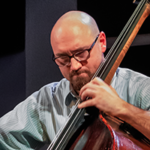 Dr. Michael Geib, double bassist, joined the faculty at the University of Central Oklahoma School of Music in 2010. He holds degrees from Clemson University and Florida State University, and has also taught at Florida State University, Oklahoma Christian University, Edmond North High School, and the Quartz Mountain Music Festival. He is committed to teaching bassists to be versed in all types of music, with his doctoral treatise focusing on teaching improvisation to orchestral double bass players. Dr. Geib maintains an active performing career with the Enid and Norman Symphony Orchestras, the Edmond Jazz Orchestra, the Lyric Theatre of Oklahoma, the Wichita Grand Opera, and the Colorado Mahlerfest Orchestra. Dr. Geib also teaches privately through Geib Musik.